Developments in Artificial Intelligence and Machine Learning have sparked the emergence of chatbots and their rapid adoption. Although the concept of an AI bot is still in its rudimentary phase, high-level executives across industries are keen on deploying chatbots for a myriad of activities, like boosting employee work productivity, customer engagement, reducing support costs, among many others. Realizing the immense potential that chatbots hold, most executives have already introduced chatbots in their organization to gain early adopter/first-mover advantage. In nonprofessional terms, a chatbot can be defined as a computer software program that can converse with a human through textual and auditory methods, to assist him/her in performing different tasks. A chatbot works using Natural Language Processing (NLP), which is an artificial intelligence field concerned with interactions between human languages and computers. The text or audio provided by the user is analyzed and processed by the bot and responds appropriately. Continuous research & development in AI and Machine Learning is fostering the creation of smarter bots with natural, accurate and intelligent responses. 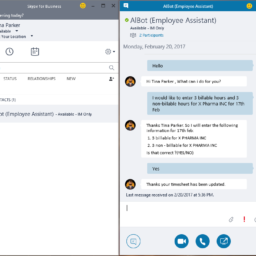 Having realized the importance of having a smart way of engagement and communication with users (employees or customers), enterprises across the world are considering chatbots as their initial step towards a complete digital transformation. Chatbots did find their place in the legal industry. The world’s first legal bot – DoNotPay was created by Joshua Browder, an English programmer. DoNotPay was built to fight the unfair issuance of parking tickets in the United Kingdom and New York. The AI law bot went on to procure over 175,000 users and saved more than USD 5 million for motorists. Learn the working of this robot lawyer here. Though this serves as a small, yet powerful, example proving the efficacy of AI bots in the legal industry, there are numerous ways through which AI bots can help lawyers and legal firms provide better insights into cases and case studies. Relevant contact information of various people etc. A chatbot can be a perfect solution for saving time and hassle, and analyze documents. The Q&A interface of a bot assists users to quickly get the information they require. Setting up notifications and reminders, etc. If your legal department uses intranet for internal communications, then here’s a quick tip – integrate a chatbot into it. This integration not only boosts the adoption rate of the intranet but helps users find all necessary case-related information in the intranet superfast as well. As mentioned earlier, lawyers and paralegals go through a ton of information daily. In a traditional environment, they need to go through various sources of information, past case studies, choose several options before getting the required gist of data. The Q&A interface of a chatbot helps lawyers in cutting down all the clunky text and overwhelmingly irrelevant data. By asking one question at a time, a chatbot narrows down the exact data a lawyer is seeking in the shortest time possible. Consider a litigation is filed after a public company announced a third-party merger. A chatbot can go through the knowledge base of the legal firm and provide information regarding similar mergers and contacts of lawyers who handled the cases. Advancements in NLP have boosted the potential of chatbots. Chatbots now understand the natural language of humans better and as a result can detect longer phrases, wider terminology and more synonyms. This understanding of language paves way for more accurate & precise responses. From an individual perspective: Let’s say Mark, who is going through a divorce, types in the chatbot interface “File a divorce.” It offers all the available offerings and solutions of the firm regarding divorce, child custody, property sharing, etc. From a lawyer’s perspective: The text can be “Murder cases in Birmingham 2012.” Using the machine learning algorithms fed to it, a chatbot can quickly match terms in all the existing documents and provide relevant answers. In fact, the law society claims that it found a 40-50% increase in firm’s efficiency due to machine learning in chatbots. Can an AI bot eat up a lawyer’s job? This may actually be a myth. McKinsey Global Institute claims that only 23% of a lawyer’s job can be automated. AI can help lawyers become more productive and lets them focus on pressing issues. Save a lot of money and boost ROI for legal firms. Acuvate is offering unique chatbot development services ; Considering AI chatbots for your legal firm? Take your first step by checking out our guide on choosing an enterprise bot builder platform!